"The archetypal Nain rug achieved international popularity during the mid-20th century. This relatively new carpet weaving center has produced some of the greatest weavers in the past century. Woven in a soft neutral color palette and complemented by accents in subdued blues, the Nain carpet is uniquely suited to Western interiors. The distinguished Nain carpet is made with the finest wool pile while silk highlights add to the dimensional quality of each lavish design. 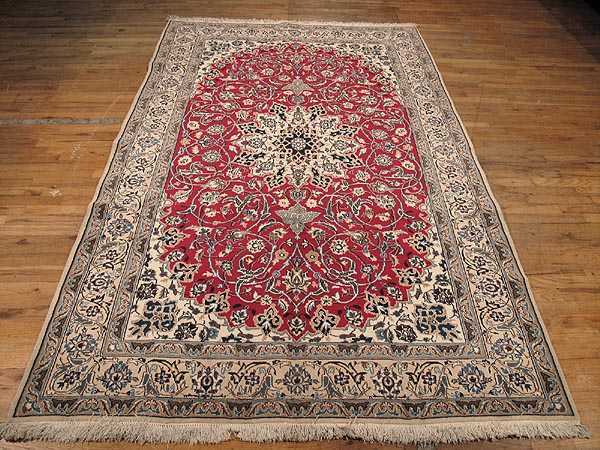 A traditional Nain rug can be rectangular or round and feature complex all over patterns, formal medallions or radiant rosettes based on the iconic domes of Iran's ornate mosques. Some of the finest Persian Nain Rugs are Habibian Nain, 6Lah Nain, and 4Lah Nain."